In 1999, in Canada, six babies were born with neural tube defects per 10,000 total births, a decline from 11.1 per 10,000 births in 1989. 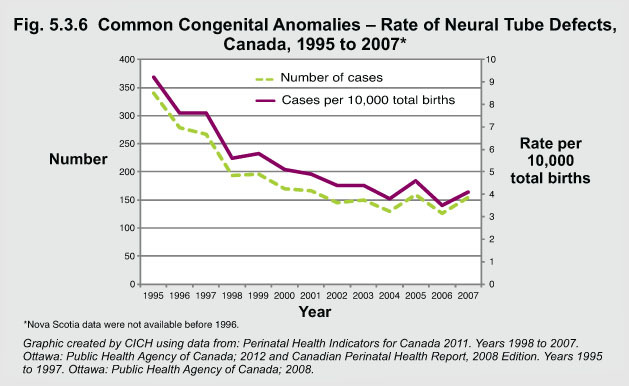 Between 1995 and 2007, the rate of neural tube defects in Canada decreased by about half, to 4.1 from 9.2 per 10,000 total births. Most of the decline occurred between 1995 and 2004, and there has not been a clear trend in rates since. Despite this, much of the decline is attributed to policy-making and education initiatives surrounding the role of folic acid in preventing babies from developing neural tube defects.